Marwadi Group is one of the well-known full service broker in northern part on India. 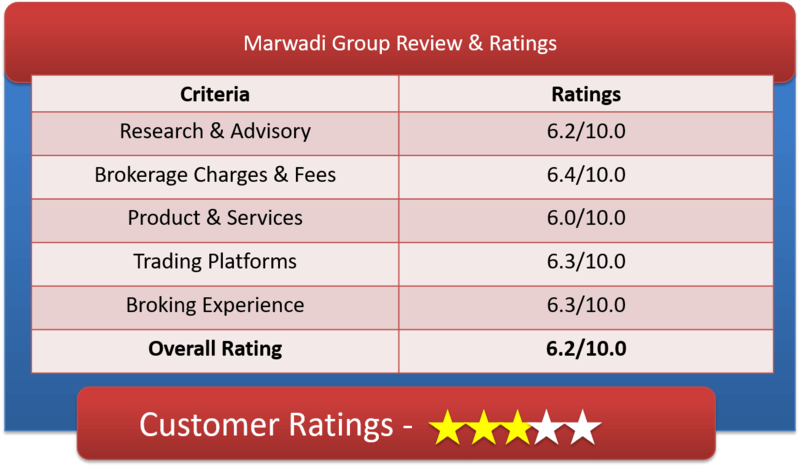 Lets check Marwadi Group review & reasons why anyone should trade with MSFL group & open Marwadi Group demat account. Marwadi Group or MSFL Group – “The company is among the TOP 10 broking houses in India. (D&B “India’s Leading equity Broking Houses 2013” Report, in no. of terminals). Ranked amongst top 10 performers in BSE in the equity segments from 2007-08 onwards. In 24+ years, the company has emerged as one of India’s fastest growing retail broking houses with retail market share at 1.32%. The broking house has 95+ branches and over 1450+ channel partners operating over 2200+ trading terminals spread across 150+ cities and servicing more than 3440+ pincodes in India. MSFL is having a new state of the arts with the world class infrastructure corporate office of 90,000 sq. ft. located in the prime location of Rajkot, Gujarat. Marwadi Shares & Finance Limited claims to have competitive brokerage rates but they want you to approach them personally for any brokerage related queries. The Madwadi Group assist their clients personally as they have branches and sub-brokers office available across India. But, they don’t want to disclose their brokerage; they want to serve each customer as different as per their financial needs. Calling or personally visiting them may help here. The charges are mostly hidden and lacks transparency on this. We reached to the conclusion that they do accept huge bargain on merit of client and their ability to pour money in market through them. Futures and equities – 0.6 and 0.30 paisa for intraday & delivery respectively. Options per lot – Rs 100 and Rs 200 for intraday & delivery respectively. This is the starting Brokerage fee that Marwadi financial services charge initially but again the fees are usually deduced with the amount of trade done and bargain achieved. By paying Rs 2500 you can open a demat account which is lifetime in nature. This money is refundable at the time of closure of demat account in future. In this case you need not pay any annual account maintenance charge. Start with no amount and then you will be liable to pay Rs 450 as annual maintenance charge here in this case. MSFL is using Desktop base -ODIN Diet & NOW, Web based – NET.net & NOW and mobile base trading platform from Financial Technologies (India) Ltd.
MG is using well reputed ODIN Diet trading platform, which is a desktop application-based trading front office solution enabling clients to connect to MSFL servers via the Internet. This platform support trading in BSE Cash, NSE F&O, MCX, NSE Cash, NCDEX, MCX Currency. Fund can be transfer from 15+ banks into your account. Direct connectivity to exchange server with high speed, investor can trade in BSE Cash, NSE Cash, NSE F&O, NSE Currency. – Web based trading platform using Net.net software, with various ad-on features like all segment broadcasts, multi-featured graphs, online payment gateways and automatic password mailer utility for better security. With this web-based portal investor can trade in BSE Cash, NSE Cash, NSE F&O, MCX, NCDEX segments. With Marwadi Group you can trade with NSE Now online portal. With this web-based platform, user can trade in BSE Cash, NSE Cash, NSE F&O, NSE Currency. – NOW they have official mobile base trading application for Equity. This software application enables the clients registered with Marwadi Group to trade in both Indian Equity & Derivatives and Currency markets. Fund Transfer from 15+ Banks are possible from Website, ODIN Diet, Net-Net Lite.